We have pages! At long last! LABYRINTH SUBLIME is no longer a collection of printed sheets. We now have 180 individual, foot-high piles of precisely trimmed and folded pages. As I write, the hand collation has just begun! This past Wednesday the cutting started. Patty Penner is the cutter and she’s a strong, energetic woman. Recall all those pallets stacked high with our printed sheets... Patty handled every sheet of every pallet, in three-inch increments. She never stops moving throughout her 12-hour shift, which certainly presents a challenge to photograph her without blurring. Smiling for my camera, she pauses a split second while positioning a stack of sheets under the guillotine. I’m guessing that the knife blade is over 50" wide. This blade retracts until activated when hands are safely out of the way. Patty has already programmed the computer controlling her Wohlenberg Cutter with the specific dimensions required. 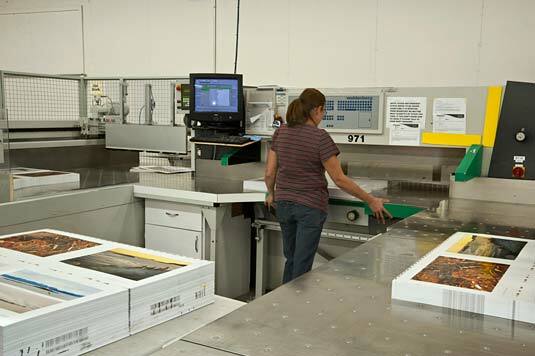 The sheets are cut in half horizontally, creating two 4-page spreads called forms. These forms are trimmed on all four edges, the cuts being exactly 1/4" beyond the final trim (which the bindery will do after the hand-sewing). You’ll notice Patty’s bright yellow ear plugs. Everyone wears ear protection, including me. In the photo below Patty tightly grips quite a number of sheets off the pallet. She snaps them, fans them, and drops them into the corner of the sloped table at right. Despite knowing that Patty has years of experience, I found this procedure difficult to watch. After all the effort to reach this stage, I couldn’t help but be concerned about potential damage, thinking that our heavy, stiff sheets are as likely to kink than gently bend with such handling. Patty’s objective is to put air between the sheets prior to jogging so that they will move individually rather than be stuck together. To get accurate and consistent cuts with the guillotine, it is essential that the sheets are jogged into perfect alignment, one directly above the other. To be out even a 1/16" of an inch would have negative ramifications — skewing and/or mis-position of the spine — when pages are folded. The table, on which Patty places the sheets, vibrates strongly, jogging all into position. Patty assists using the hand-held tamper, the white object with a post-like handle which can be seen resting for the moment against the sheets at right. Once sheets are aligned, the jogging table is levelled and re-connected to the cutting counter — all with the touch of a button! Patty glides the batch of sheets across and over to the guillotine where she positions them for cutting. In the photo below, Patty’s hands are out of harms way at either side of her hips. She’s actually depressing two separate control buttons widely space along the table edge. Only when both buttons are triggered simultaneously, one under each hand, does the knife blade come down. It’s a full-proof safety measure to avoid injury. While the cutting continues, Cornie Wall tunes up Folder #3. I’m told that in Mennonite country, Cornie is a common name, short for Cornelius. When I met Cornie, he was busy cleaning the many belts of the folding machine to prevent scratches or other markings that would mar our “flats” as they are transformed via this equipment to folded pages. He took great care to finely adjust controls to ensure folded pages would be perfectly square and the single fold exactly in position. Here’s a double-exposure, action shot of Cornie. In the foreground he’s placing our flats onto the folder belt where he deftly offsets each by 1/8", fans and tamps them into alignment; in the background, he’s piling folded pages onto a pallet. In between the machinery does the folding. As the folded pages exit the folder, Cornie gathers a bunch to place on a pallet. There is an order to what goes on each pallet. 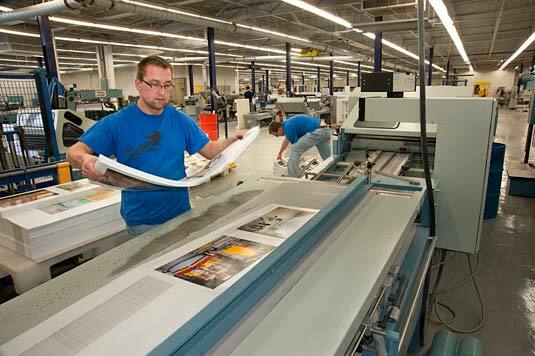 He groups all three forms (four-pagers) to be nested together by the collators to make a consecutive 12-page section. 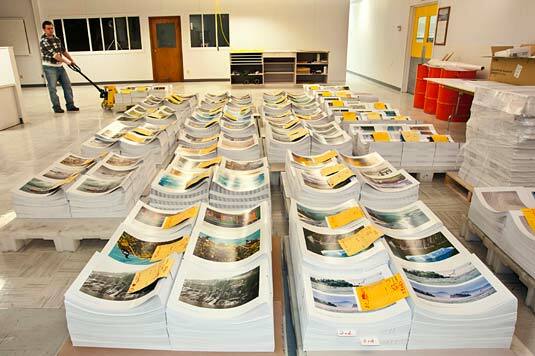 The collation will to be done by hand over a full week or longer... we’ll see soon. Cornie works nearly two days, assisted by Sam Wilns, on our project. An hour before sunrise Friday, Tony Cianflone with Andreas Wegner continue. I’m quite appreciative of these operators, and I’ve became quite fond of Folder #3. 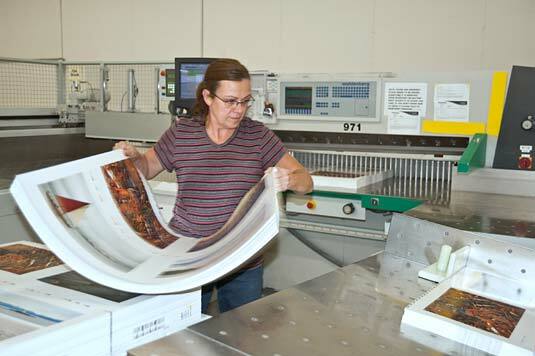 Under their skilled hands and watchful eyes this machine did such a fine job with sharp and precise folds, page edges aligning perfectly, hour after hour. However, Saturday morning, Folder #3 broke down due to the unaccustomed exertion (strain??) of dealing with such heavy sheets. Our project pushes limits at nearly every step! Fortunately, by end of shift Saturday evening, the folding is completed! 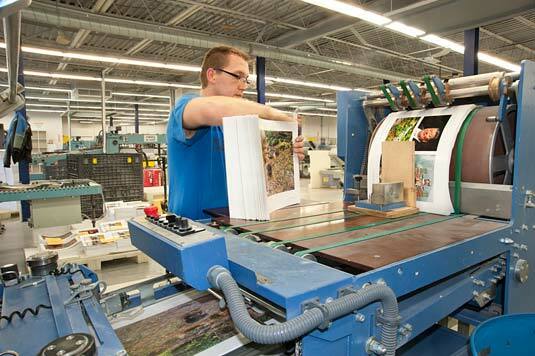 Sam delivers yet another pallet of folded pages to the collating area. The photo below shows 57 unique forms (four-page sections) with two high piles of each, the piles being about 14" high. By 6:00 pm Saturday, all 90 forms (180 piles) are delivered. I look across all the pages of this project, and feel elation. Finally, after years of conceptualizing and working toward creating LABYRINTH SUBLIME, we have pages! I continue to enjoy Altona and the crisp, sunny weather. But I dearly miss my Pat who is on Salt Spring. Neither of us sleep well apart, despite many phone calls throughout the day and evening. In 27 years of marriage, we’ve not been apart for such a lengthy period. Our son Glen and a school chum from Holland are also at home for their Spring Break. I’m ready to go home too.... but the work is not yet done. Stay tuned for more to share with you as the collating gets underway, along with my inspections. The Manitoba weather has improved — only about minus 8°C today. We experienced a major blow a week ago, with winds to 140 km, snow drifting, and cars getting stranded. At least one couple I know ended up abandoning both their vehicles and not making it home that night. Lydia’s vehicle got stuck in a big snowdrift not more than a half kilometer from her home following the end of her shift at Friesens. Calling her husband by cel phone, he came to rescue her; however, his car got stuck on the opposite side of the same huge snowdrift. Impossible in the white-out to find their way home on foot, they pushed through the wind up the first driveway they came to, and knocked on the door of the nearest house. Drifts on the driveway were already six feet high. Fortunately, the home-owners were in and extended hospitality to Lydia and her husband. Pressmen told me that they carry an emergency box in the vehicles just in case they might have to overnight in their cars during such inclement conditions. A funny side story ... Chef John Folse of whom I wrote to you back in January, the famed Cajun Chef and food manufacturer from Louisiana whose encyclopedic cookbooks are printed by Friesens, has bestowed on his new blast freezer (nearly the size of a football field) the name Manitoba. Among the locals here in Manitoba, holidays to the Dominican Republic, to Maui, to other warm destinations are popular. I look forward to writing to you again shortly. Off I go to personally collate and inspect the first five book blocks which will be couriered to Felton Bookbinding in Ontario tomorrow so they can start the production proofs. 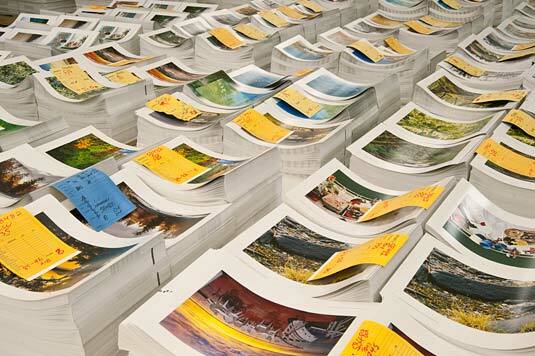 A month to six weeks is required by Keith Felton and his masterbinders to complete these proofs, the first of which will be shipped to Friesens for measurement. Starting in May, Friesens will be making the linen/velvet presentation boxes for LABYRINTH SUBLIME. This work has to await having in hand a finished bound copy of LABYRINTH SUBLIME so as to customize the fit of the presentation box. Thank you for your letters! I do appreciate them! Copyright 2011 Nahanni Productions Inc.